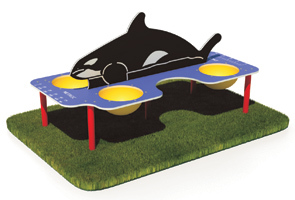 The Whale Sand/Water Table is an interactive play unit designed to help children learn U.S. and Metric dimensions while having fun at the same time. Perfect for children ages 12 and under, this independent play component is also ADA accessible and features multiple sand/water basins allowing numerous children to play at once. The friendly whale comes standard in the fun colors shown. Steel posts are made from 3.5" O.D. 13 gauge galvanized steel that is powder-coated with a triple flo-coated corrosion protection for a superior, high gloss, no peel, no flake finish. Optional cover is available to protect from corrosion and vandalism.